We have designed effective procedures so that when a customer encounters a problem, we can assess the issue and put things right, with least inconvenience caused for our customers. Our quality offices around the world check on our performance and seek ways of doing things better. Our “customer first” philosophy is a part of Toyota DNA and means we always listen to what our customers have to say and use their opinions and experiences to make improvements. 100% of the reports from customers in the markets are analysed. Complete customer satisfaction at every stage. Our commitment to quality does not end when we hand over the vehicle to the customer. Through vehicle recalls and our customer service and satisfaction campaigns, we ensure quality issues are recognised and addressed when and where necessary. Since 2010 we have carried out a worldwide re-organisation of the way we work to maintain and improve the quality of our products and our service to customers. effectively on improving quality, and respond promptly and with openness to any issues that occur. Throughout, we take care to understand the situation from the point of view of the customer. We have designed a step-by-step method to ensure any problems with our vehicles are identified and remedied as quickly and thoroughly as possible. Called Early Detection and Early Resolution, it is our global process for checking, assessing and rectifying any problem reported by a customer. The information and details of any remedial actions are shared, so that any recurrence can be prevented, or promptly rectified. Our EDER mission is to minimise customer inconvenience, while solving any problem within the shortest lead time and taking action to prevent an issue from spreading further or becoming more serious. Step by step method to identify problems and remedies as quickly and thoroughly as possible. We have created a network of regional Customer Quality (CQ) offices that serve as an important tier in our co-ordination of worldwide quality control, forming a link between the leadership provided by our Global Headquarters and the local quality activities carried out in individual national and regional markets. In Europe the CQ office is located in Brussels. The CQ offices’ mission is to ensure that the different parts of our business work together to maintain and constantly improve quality, operating with transparency, taking prompt action and being committed to listening to the customers’ voice and understanding the customers’ point of view. 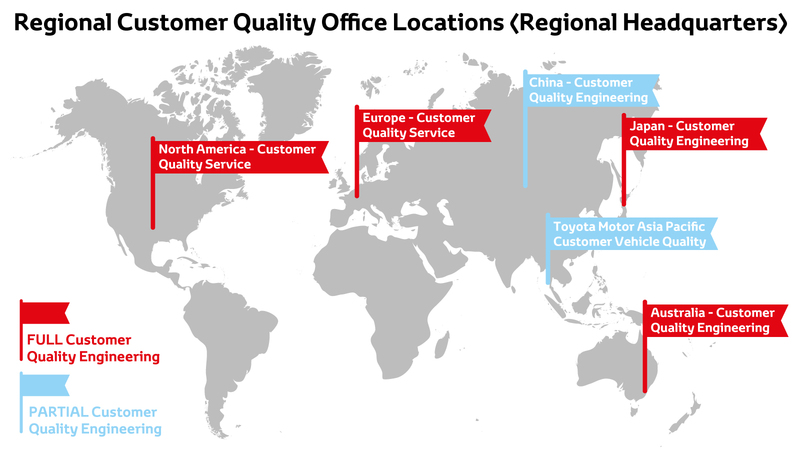 Toyota Regional Customer Quality Offices around the world. When we discover an issue that might compromise the safety of customers, we will immediately take the necessary steps to correct the matter. The actions we take will be the subject of a vehicle recall. The owners of all the vehicles affected will be contacted and the repairs or adjustments we make to their vehicle will be carried out at no cost to the customer. Our work quality is aimed at bringing smiles and peace of mind to our customers. When we have to carry out a vehicle recall we do everything we can to reassure our customers and cause them as little inconvenience as possible. To help you understand our recall process, please find the answers to the most frequently asked questions. If my vehicle is recalled, how will I be notified? Vehicle owners will be informed by letter or by a phone call. Where we find that customers have, for any reason, not brought their vehicle in for a recall inspection or work, we will follow up our notification with a reminder. What does a recall notification include? The notification will confirm the model name and registration/licence plate of your vehicle. You will be asked to arrange to take your vehicle to a local authorised Toyota dealer or workshop, at a convenient time for the recall inspection and any associated work to be carried out. It will provide a description of the possible defect that has been identified and the potential hazard(s) it could cause. It will explain what warning signs you may notice, both in the way the vehicle behaves when driven and any warning lights you might see on the instrument panel. It will explain how we intend to fix the problem, when that solution will be available and how long it should take to carry out. It will advise you what to do next and provide you with contact information if you have any concerns or questions. What should I do if I receive a recall notification? The Notification will make clear what your next steps should be. In most cases you will need to contact your local authorised Toyota dealer or workshop to make an appointment for a vehicle inspection and, if required, repair. You will be told how and where to find out further information if there is anything you do not understand, or if you need further explanation. What if I don’t receive a recall notification? If you do not receive a notification, but believe your vehicle is involved in a recall, you can contact your local authorised Toyota dealer for advice. What should I do if I am worried about still driving my vehicle? We recommend you have your vehicle inspected and, if necessary, repaired as soon as possible. In the unlikely event of an issue being detected that presents an immediate, serious concern, additional steps will be taken to alert vehicle owners. Do I have to pay to have my vehicle fixed? No, all recall inspections and any associated repair work will be carried out by an authorised Toyota dealer or workshop at no cost to the customer. The belief that “the customer always comes first” has been at the heart of our business, ever since Toyota was founded. In every aspect of our work, including our vehicle dealerships, we make great efforts to build and maintain good relationships with our customers, and everyone in our workforce keeps the “customer first” policy in mind when doing their job. This helps build trust and mutual respect and ensures that we remain aware of their opinions and preferences, helping us design and produce ever-better vehicles. By listening to the opinions and reactions of our customers we can learn what their expectations are of both our business and our vehicles, so it is important that we encourage feedback. We provide a wide range of opportunities for people to share their views, including simple conversations with staff in vehicle showrooms, participation in focus groups or surveys, contact with our customer relations departments and engagement with our social media channels. Of course this includes both praise and complaints, equally. Further feedback and data are collected from our dealers and our suppliers. We also closely monitor customer opinions gathered by third parties, such as newspapers, magazines and on-line publications, and the leading independent satisfaction surveys, such as those conducted internationally. We make sure that the insights we gain from listening to our customers are quickly shared among all the relevant parts of our business. This intelligence-gathering and analysis of customer feedback helps us with planning new products, raising quality standards and improving the way we work and the services we provide. In this way the “voice of the customer” remains a fundamental part of our business.